The Christmas tree dates back to 16th century Germany. Families decorated fir trees with colored paper, fruits and sweets. The tradition spread through Europe and was brought to the United States by German settlers.The selecting and cutting of the tree was a family event which involved loading the family into the wagon or sleigh. They would then spend the day traveling to a nearby forest, to choose and cut the perfect tree. In 1851, the first Christmas tree stand was set up on a street corner in New York city. Today there are over 32 million Christmas trees sold each year in this country. 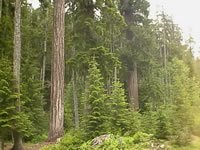 There are over a million acres planted with Christmas trees, employing about 100,000 people annually. For every real Christmas tree harvested, 2 to 3 seedlings are planted in its place. The average six foot Christmas tree will take six years to grow, but certain species may take as long as fifteen years to reach that height. Whether you are going to use a living tree or a cut tree, there are a few important things you should know about selecting and caring for your Christmas tree. The first consideration should be freshness, after all, you want to be sure that your tree will survive through the entire holiday season. Don't get your tree any sooner than you have to, and then keep it in an unheated area such as a porch or garage to protect it from the elements until you are ready to decorate it. Without a doubt, the freshest Christmas tree will be one that is still living. Many families will traditionally buy a living tree from a nursery each year, and then plant it into their landscape, along with the holiday memories it holds. Living trees take extra care, or they may not survive long enough to be planted in the yard. Select a tree that fits your needs, in size and shape. If the tree is not already in a planter or pot of some sort, the root ball should be set into a bucket or container, to protect the roots... and your floor. Never lift the tree by the stem. Living trees can only be kept indoors for ten days. Before you bring it into a heated room, it should be conditioned to help lessen the shock to the plant, by keeping it in the garage or other unheated area, for a few days. When you bring it indoors, set it in a cool location, out of direct sunlight, and away from any heat sources. Avoid using heat producing lights. Watering is essential. Moisten the soil completely before you bring the tree indoors. Keep it moist the entire time that the plant is kept in the home. When it is time to put your Christmas tree outdoors, you should once again move it to an unheated area of the house or garage for a few days, before planting it into your landscape. If the ground is frozen, or you are unable to plant your tree immediately, it should be placed in a sheltered area with the root ball mulched with a thick layer of leaves or compost. 'Cut your own' tree farms give you and your family the opportunity to enjoy mother nature, fresh air, and spend some good quality time together. It is the kind of experience from which childhood memories are made. Since you know that your tree is as fresh as can be, your only concern will be having a good time, and finding a tree with the height and shape that fits your needs. The farmer will usually provide you with a saw, or if you'd prefer even cut and carry it for you. The corner Christmas tree lot is popular because of the convenience for people who have limited time to shop for a tree, or when choose-and-cut farms are not available. These temporary lots are usually run by local civic clubs, Boy Scouts, school groups etc. as fund raisers for those organizations. Unfortunately, at corner lots, you will have no way of knowing how long it has been since the tree was cut. Because the length of time since cutting, as well as the way the trees have been handled, can greatly influence how well they will hold up in the home, always check carefully for freshness. Each tree should have a healthy, green appearance. Needles should appear fresh and flexible and should not come off in your hand if you gently stroke a branch. Lift a cut tree a couple of inches off the ground and let it drop on the stump. A few dried, inner needles may fall, but if any of the outer, green needles should fall, forget that tree. If your second or third choices do the same, go to a different lot. Once you and your Christmas tree have safely returned home, make a fresh cut across the bottom of the trunk, to open up the pores in the wood, allowing it to absorb water readily. Make the cut about 1 inch above the old base, at a very slight angle. The tree should be immediately set in the stand, and placed where it will spend the season. Be sure to use a stand with a large enough water reservoir so that it wont need refilling too often. Depending upon the size, species, and location of the tree, it may absorb a gallon of water in the first day, so it should be checked frequently and re-watered as necessary. As long as the tree is able to absorb and transpire water, it will stay reasonably fresh and fire-resistant. It is important that the tree always be kept watered and not allowed to dry out. Once the reservoir dries, a seal of pitch begins to form on the cut. After 6 hours, the tree will no longer be able to absorb water, and will quickly dry out. To remedy this, it will be necessary to recut the stump again, or the tree will begin to lose it's needles. Always keep your tree away from heat sources like furnace vents, fireplaces, radiators and television sets. Make sure that all of your light cords are in good shape. If the insulation on the wiring has become brittle or cracked, discard it. It's time to buy a new set! Be sure to unplug the lights before you go to bed or any time you leave the house. After Christmas, recycle your tree, rather than sending it to a landfill with the rest of your trash. Use common sense. Taking precautions such as these will help preserve the unique beauty and tradition that only a real Christmas tree can provide.